Residents across the USA often require their new or used vehicles to be picked up and delivered to another location. Whether they have purchased a car from a dealership or a private owner, at auction or online, hardworking Americans rarely travel to distant cities and states to transport the automobile themselves. Instead, they frequently order safe and convenient door-to-door shipping services, relying on experienced professionals to handle the task. MoveWheels is among the best vehicle transportation companies in the industry. We pride ourselves on an honest, customer-oriented approach. Multiple businesses handle vehicle delivery in the USA and competition in the industry is fierce. Therefore, prices are usually affordable, especially on the most common routes. However, the majority of carriers are specialized for a particular type of operation or locale. Many are licensed only in individual states or regions. Some smaller companies have drivers for each vehicle, while others maintain a fleet of both open and enclosed haulers that operate nationwide. Customers, from their point of view, are in need of versatile and comprehensive car transport services. Choosing the right carrier depends on many factors. But regardless of how much the vehicles weigh, their size, or their operational condition, owners require them to be picked up from garages, storage facilities, auctions, auto shows, sea or air ports, dealerships or private sellers, and be delivered door-to-door to the specified destination. What is door-to-door car delivery? Aiming to meet a variety of customers’ needs, MoveWheels offers a multitude of carrier choices, but strongly recommends door-to-door vehicle transportation for delivery, as this the best and most convenient of all possible methods. Transport with MoveWheels is simple and easy. You don’t need to bring your vehicle to a local station, pay a storage fee, and wait for the driver. Our highly proficient shipping agents monitor the entire process. Just specify when and where your vehicle is available for pickup or receipt, the destination address, and any special instructions or requirements. We will take it from there. the shipment is completely coordinated. You can arrange to meet the driver and oversee the loading/unloading process yourself or just leave the keys and go about your daily business. Thus, customers lessen their time, effort, and anxiety. Meanwhile, we guarantee the safe shipment of your vehicle by handling all logistics and insurance issues. 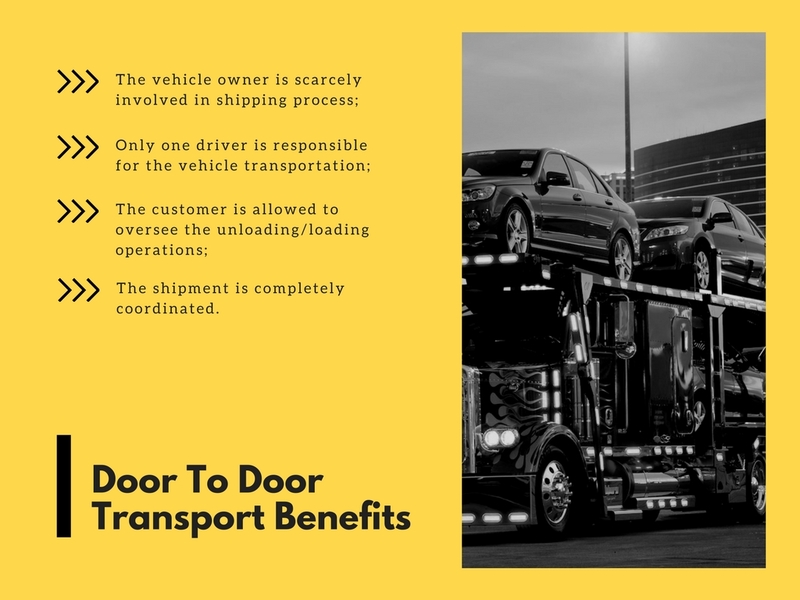 Once we receive all the logistical details and assign a carrier, our experienced shipping agents can very quickly and accurately quote the cost of a door-to-door transportation. Even broken or otherwise inoperable cars can be delivered swift and secure. They will be initially loaded onto the hauler and unloaded only after arriving at the final destination. By accepting other types of vehicle transportation, owners expose their treasured autos to multiple risks such as being loaded and unloaded 4 or more times. If the vehicle is damaged somewhere en route, the customer learns about it only upon arrival. Meanwhile, by managing door-to-door shipping, we provide extra loading and safety guarantees while partnering only with reliable carriers. green (with multiple tree branches hanging across the road). If your shipping agent asks you to bring your vehicle down a hill, please, be receptive. This car shipping practice is standard, and in some cases may be the only possible way. Initially, you will know the cost of door-to-door transportation. Inspection, insurance, and documentation can be discussed online or by phone. Everything is coordinated for you by our experienced professionals, so give MoveWheels a call today!